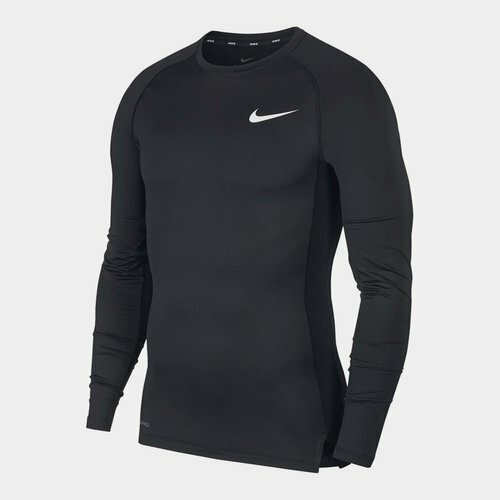 When you're working hard and putting in some serious effort, keep your cool in Nike's Pro Cool L/S Compression T-Shirt. Made from a light mix of polyester and elastane, the performance material is minimalist in design so there's no weighing you down as you build up a sweat. Focused on delivering a cool feeling during any activity, you get to stay in peak performance for longer. For those of you new to compression wear or not exactly sure of the concept then quite simply it's designed to increase blood circulation so more oxygen reaches your muscles. Made for a snug feel that's almost like a second skin beneath other layers, in Nike's own words this Pro Cool shirt achieves a 'locked-in tight fit and precision feel'. While there's little in the way of added features, a mesh panel is strategically positioned down the spine to leave you fresh and cool where you'll feel it the most.